A military group march in a band in the Quay at the Fortress of Louisbourg in Cape Breton, Nova Scotia before the cannon is fired. Dressed in their full band uniform that is a brilliant red colour, playing their instruments representing the days of past, the officer is easily recognizable in his blue uniform. 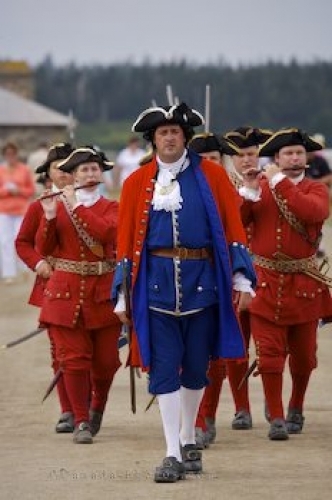 Picture of a military march by the members at the Fortress of Louisbourg in Cape Breton.